Stuhlfelden is a village in the Pinzgau area of Salzburg. It has a total population of approximately 1,550. Stuhlfelden is situated within the National Park Hohe Tauern. Stuhlfelden is well-connected with the rest of the world via a local railway and major roads. The village is a good base for exploring the skiing regions of the Pinzgau or for any kind of hiking vacation. The highest mountain on the territory of Stuhlfelden is the Gaißstein, which is 2,363 metres high. Summer and winter sports are the main reason to spend time in Stuhlfelden, as sightseeing opportunities are limited. This can be seen pretty much at the first glance: There are plenty of houses all over and around Stuhlfelden that let rooms or holiday flats. In terms of sights and attractions, enjoy the general prettiness of the village and its Alpine surroundings. Note Schloss Lichtenau, a chateaux at the centre of Stuhlfelden. 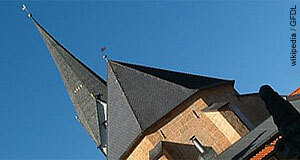 It was built in the early 16th century and comes with a cubic base that has four little towers at the corners. Schloss Lichtenau now hosts a school for disabled children. Another chateaux of the village, Schloss Labach, was first mentioned in 1323 - it is thus significantly older than Schloss Lichtenau. The Heilbad Burgwies is a spa that uses water from a local spring. It contains high amounts of sulphur and iron. The springs and the building were first mentioned in a document dating back to 1450. In the surroundings of Stuhlfelden, you will find plenty of attractive destinations for day-trips and excursions.